"Don't let it out." 20th Century Fox has unveiled a teaser trailer for a mysterious new sci-fi horror thriller called Morgan, with the tagline "what is Morgan?" It's obviously not "who", but "what", making me wonder if this is some weird alien creature they've captured that is pretending to be human. A bit like Under the Skin but if that film was made by Hollywood and not Jonathan Glazer. 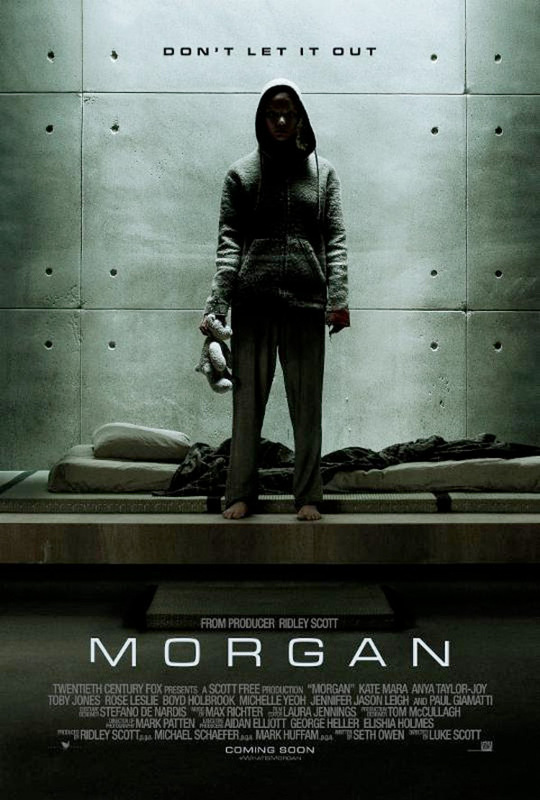 Morgan is the first feature directed by Ridley Scott's son Luke Scott, and stars Kate Mara as a corporate troubleshooter sent to investigate this "person". The full cast also includes Anya Taylor-Joy, Toby Jones, Rose Leslie, Boyd Holbrook, Michelle Yeoh, Jennifer Jason Leigh, and Paul Giamatti. I'm certainly intrigued, this is a good tease. A corporate troubleshooter (Kate Mara) is sent to a remote, top-secret location, where she is to investigate and evaluate a terrifying accident. She learns the event was triggered by a seemingly innocent "human," who presents a mystery of both infinite promise and incalculable danger. Morgan is directed by up-and-coming filmmaker Luke Scott, the son of director Ridley Scott, making his feature debut after a few short films previously. The screenplay is written by Seth W. Owen, along with Luke Scott. It's produced by Ridley Scott, Michael Schaefer, and Mark Huffam. No exact release date is set yet, but 20th Century Fox has plans to release Luke Scott's Morgan in theaters sometime in 2016. Stay tuned for more updates. Your thoughts? Looks like Rose Leslie gets destroyed pretty early on. Really like these experimental lab bunkers that have terrible security and donuts running them. Seems a little Ex Machina-ish, no? They let politicians out, so, how bad this one can be?